Published in various magazines over the years, some from foreign magazines so roughly translated to English. 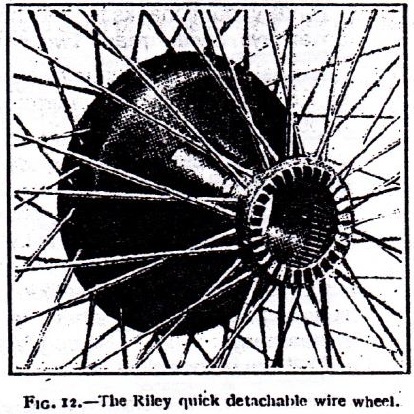 The Riley detachable wire wheel is one of the older inventions, and is made in several types – one with twin tyres, one with bolt fixing and a third with a quick-action locking ring. All types may be procured with steel disc covers. The loose wheel of the last type has internal serrations, which mesh with corresponding serrations on the fixed hub. The locking ring screws home on a plain thread, but is prevented from unscrewing in use by a number of spring bolts, which catch on the ratchet teeth shown in fig.12, and so keep the ring locked up tightly on its thread. When the owner desires to remove the wheel, a special spanner provided presses the spring bolts out of engagement with the ratchet teeth, and the locking ring then unscrews freely. Bill Hylton has given the Editor a photo-copy of an advertisement for Riley Detachable Wire Wheels published by Riley (Coventry) Ltd. 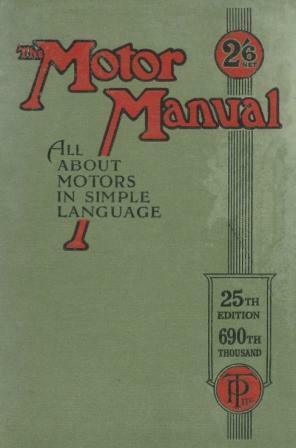 The advertisement tells readers that they should insist on these wheels being fitted to their cars because of all wheel–changing systems, this is the simplest and most rapid. In the event of a puncture a wheel may be changed in one minute. The wheels were claimed to be stronger than wood wheels, more reliable and lighter than steel, and capable of enhancing the appearance of a car. 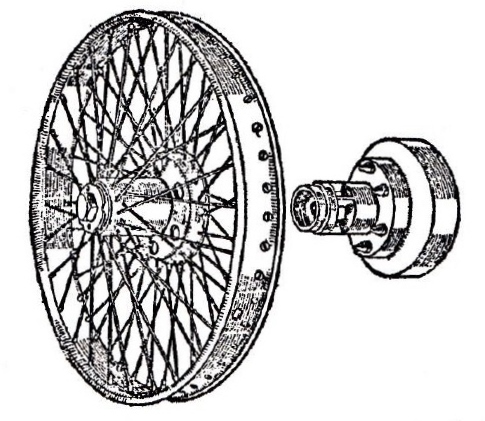 A drawing published in the Motor Manual is shown here, and it will be seen that the Riley detachable wheel system consisted of an inner hub provided with tapered driving studs which engaged with holes in the wheel hub. The inner hub and wheel hub shell were made a taper fit, and it is claimed that this was practically able to take the drive. For those Register members to whom security bolts are unknown the following passage makes fascinating reading. Instead of putting one side of the cover on the rim, next the security bolts, and finally the tube in the usual manner, put firstly the tube into the cover, then one security bolt inside the cover (with the canvas part next to the tube in the usual manner), then, keeping the security bolt in position by pressing the two beads together, put the security bolt in one of the holes in the rim nearest the valve, and the valve of the tube in its hole together, and force the inside bead of the cover from the valve of the security bolt into its place in the rim, and tighten the security bolt so that it keeps the cover at that particular section in position. Next - without putting any more security bolts in – lever the whole tyre and tube together onto the rim. This can easily be done, whilst the one bolt already inserted keeps the cover tight on the rim in the one place. Next insert a tyre lever from the outside of the cover, but from the side nearest to the car body, and lever the tyre away from the body. This will expose the bolt hole, and the security bolt can be dropped in. With the lever the tyre can be easily sprung back over the security bolt, and the latter lifted to make sure it is free. Repeat this for each bolt, and then get the other bead of the tyre on in the usual way. The whole idea is to put the security bolts in, not, as usual, from the inside of the cover with one’s whole hand groping for an unseen hole, but by pushing the opposite bead away from the hole and just dropping the bolts in. Translation of an article in the Austrian magazine "Allgemeine Automobil Zeitung" 29 December 1912. England is the only country from where modern wire spoked wheels come from. It is not necessary to say anything about the old wire spoked wheel, they were not detachable in the way the wire wheels of today are, and were abandoned because people did not find them attractive, they were difficult to clean and were probably in those days not as strong as the wooden wheels. This changed completely about two years ago. The wire wheel is back, highly appreciated, especially in Austria, one is almost ashamed not to see his car with wire wheels. For many people wire wheels are more attractive than wooden wheels. We will not discuss taste. All those who have the intention to buy a new car should think about wire wheels. It appears that we like the wire wheels more than the English, because many cars in England are still not seen with wire wheels. To be honest, the most important reason for choosing the wire wheels is not the beauty but the possibility of a quick change. It is possible in the case of a problem with a tyre, without much effort the driver can take away the tyre with the wheel and mount another wheel with inflated tyre. This manipulation takes only a few minutes. On the downside it is a fact that to locate two spare wheels on a car is not possible without problems. If you take only one wheel then you are without a spare after the first tyre problem, with the next problem you then have to replace the tyre. For this reason many drivers prefer wooden wheels with detachable rims because you can easily carry two rims with inflated tyres on the car. You can understand easily that the evolution of detachable wheels in England is far from ended. We know in Austria that the only big English companies who send detachable wheels are Rudge Whitworth and Riley. But beside those two there are in England still many small companies fabricating detachable wheels. The principle by all of them is almost the same, there are only small differences in the design to see, to avoid copying. It seems now that an unexpected competitor comes against this system, namely the steel pressed wheels. This system is not new, but now it’s time has come. For heavy cars and racing cars steel pressed wheels were used but until now not for luxury cars. Cars with steel pressed wheels were seen at almost all stands at the Olympia show. At this time there is only one company making this new wheel – Sankey. From the outside you can at first glance not distinguish it from a wooden wheel. It is composed from two parts which are laid on each other and welded together. This wheel looks like a wooden wheel and has all its advantages. It has also all the advantages of a wire wheel because it is detachable. Moreover it is lighter and smaller than a wire wheel, so one can take two such wheels on board a car. The question about their durability is still open. Now, because Austria’s factories are using Sankey wheels, more experience will come up soon.